Disclaimer: I was provided with the bottom pictured Steiner promotional items for giveaway purposes. I am NOT giving away a tractor. The opinions in this post are my own. We have an old tractor. It's from the 70s, a Ford, and a brilliant blue. The boys love it. Old tractors are pretty cool to have around, and for the most part, ours has done the job over the past 12 years getting up hay from the pasture, raking the horse arena, and fixing the driveway when it washes out. But the thing about old tractors is that they break down. A lot. And since they're vintage, it can be challenging to find replacement parts. Thank goodness for the internet, right? 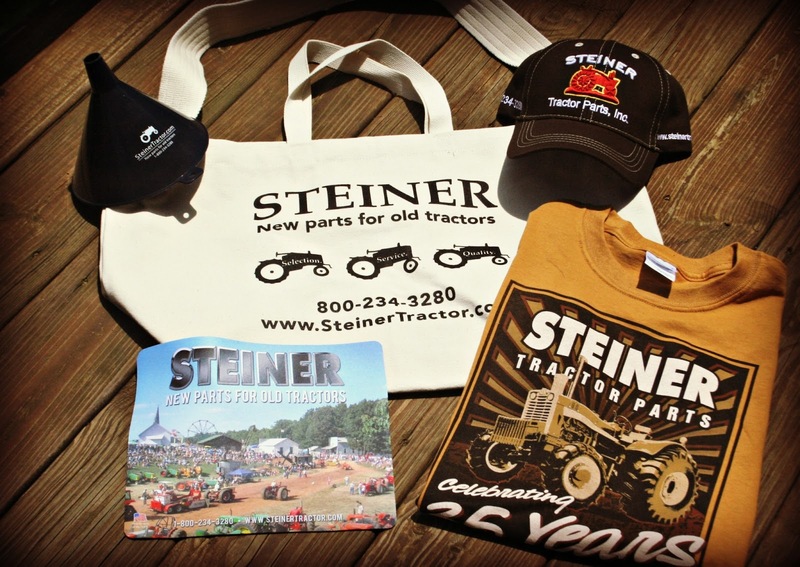 You can find a huge assortment of new parts for old tractors at Steiner. Steiner is providing the following fun items for one lucky winner: a funnel, a mousepad, a t-shirt (size large), a hat, and a heavy duty canvas bag. The winner will be able to show the world their love for old tractors! (Sorry, but I am not giving away a tractor!) To enter, just click on the Rafflecopter giveaway below. Oh my, my grandpa would have loved having a Steiner's around when I was a kid...he hated having to put his old Allis Chalmers out to 'pasture'! That old tractor is a classic!! My father-in-law has some old tractors/cars in their backyard, I always take pics of them..
Nice tractor---but I'm really here to tell you I made the rhubarb recipe and D and I LOVED it! Thanks for sharing! When we purchased our first home in Virginia in 2007, the home owner offered to sell us his tractor along with the house for an additional amt. of $$. Hubby said No, that he didn't want to buy someone else's problems. We still don't own one, but it's on our ever growing list of things we want. That blue tractor is awesome by the way! I can see why your sons love it so much. That's a cool tractor. I've never seen a blue one. Hope you can keep it running a while longer. What fun! Tractor collectors will love these. My dad loves old tractors! He was a farm boy in Nebraska way back when. I'm entering for him! And I love your blue tractor too!! oh, that is too cute! I love your tractor! I've always, always wanted to drive a tractor. I've not given up yet! This is THE prettiest tractor I have ever seen. I would LOVE to have it to drive to church!!! I hope I have entered right! I KNOW, I do NOT win the tractor, the postage would be outrageous.BUT the blue is just beyond awesome. AND I am not even a BOY. I have a friend who loves and rebuilds tractors. I've come to the place where I would love to have an old tractor, too. I can't say that I'm much interested in the small prizes; enter me in the draw for the tractor. Bears Noting, Life in the Urban Forest (poetry). 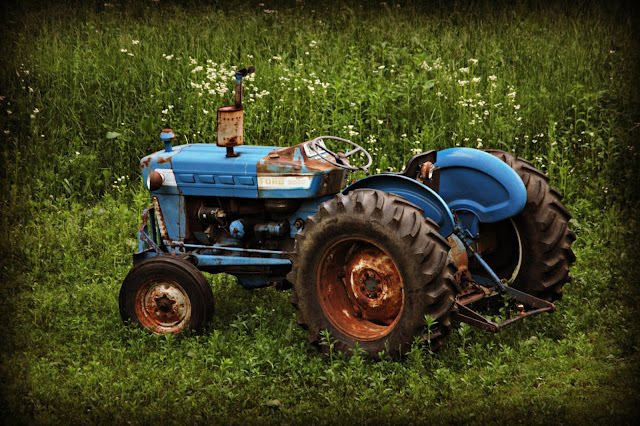 Love your blue tractor! I know the boys love it too. Hope you all are enjoying the summer! My husband would love the hat! That is a great, old tractor! My son would love to have this awesome prize pack. To bad no tractor. Lol. Excellent picture of the tractor! I'm not entering the contest... let someone have the stuff who will use it. Our tractor is a 1954 so I am well aware of the breaking down part. I recently redesigned the fuel system and eliminated the ancient filter and cut off. That has saved me so much trouble. I'd win for my dad. I would love to win this for my husband! He would love it! That is a cool old tractor! Love the blue. I see a lot of them that color around here. Id like to win for my teenage son. He loves different tshirts. My husband, as we recently had to move back to town and miss the country. What a great tractor! I love the color! I'd like to win for my Husband-he would love it! I would love to win this for my husband. He is a fanatic about old tractors. My 7 yr old son.. BIG tractor fan here!!! I'd love to win this for my tractor/farming crazy son. Hubby and son would both like this. I would love to win this for my husband.